IRISH POLITICS HAS a lack of women but just because you’re a woman doesn’t mean you deserve to be promoted. That’s the argument that will be made in the wake of Enda Kenny’s decision to ignore the women in his parliamentary party as he reshuffled the junior ministerial ranks yesterday. But just how much weight does it hold when you consider that legally binding gender quotas – 30 per cent of all of a party’s candidates must be female on threat of funding cuts – are coming into effect for the next general election? The Taoiseach needed women, but he decided not to appoint any as Ministers of State yesterday. It’s a decision he could be left to rue. Geography trumped gender – that’s the only message you can draw when you see Taoiseach opting to promote Damien English, Dara Murphy, Joe McHugh, Simon Harris, and Paudie Coffey yesterday. They’re all relatively young men, but more importantly they are based in tough constituencies and could do with the profile ahead of the next general election. But even in the geography stakes all is not rosy in the garden as south Dublin is left without any Fine Gael ministers and Galway has also lost its only minister – Fine Gael’s Ciarán Cannon. One male junior minister joked yesterday that he’d have to buy a dress given the lack of women in the junior ranks, but this is a serious issue. Yes, Ireland now has the most female TDs ever – 27 out of 166 – and there are more women sitting at Cabinet now than at any time in the history of the State. All good things but the country sits 90th in the global rankings of female political representation. Having no female junior ministers to choose from when appointing Fine Gael people to Cabinet last week saw Kenny opt to pluck Cavan-Monaghan’s Heather Humphreys from the backbenches. It was a brave move, but he could have gone further in plumping for at least one of the assumed female frontrunners for a junior minister post. The likes of Aine Collins, Mary Mitchell O’Connor or Regina Doherty were all thought to be in contention, but have all missed out. Cork North-West deputy Collins has been usurped by Dara Murphy, a TD for Cork North-Central. But if Kenny wanted a good mix of geography and gender then Mitchell-O’Connor might have been smart choice given Dún Laoghaire doesn’t have any minister – an unusual state of affairs for the area that has been served by the likes of Mary Hanafin and Eamon Gilore in the past. In Doherty’s case it was always going to be her or Meath West’s Damien English. The experience and loyalty of English, particularly in heaping to get Helen McEntee elected last year, appears to have prevailed. At an event in Dublin last week, Doherty painted a grim picture of what politics is like for a woman. She described it as a “culture takes you in, chews you up, spits you out and expects you to bounce back up tomorrow morning in a pink frock and look wonderful”. At the same event, Labour councillor Rebecca Moynihan described political parties as “deeply, deeply misogynistic organisations”. It’s worrying to hear such words from two people just starting out in Irish politics. But at least Labour’s reshuffle worked out better for women. Kathleen Lynch was retained as junior health minister and Ann Phelan got the nod for a new rural affairs portfolio. Given it had only six spots and Fine Gael had nine, the junior coalition partner has done a hell of a lot better to achieve gender balance than the largest party in the State. It’s no surprise that Labour Women were out in force commending the appointments yesterday, but they had some words of criticism too, voicing their “concern” that Fine Gael “did not see fit to promote any women to their junior ministerial ranks”. “We feel that this was a missed opportunity to have a more diverse mix of voices, talents and experiences within our junior ministerial ranks,” Sinead Ahern said. It’s hard to disagree with such sentiments. 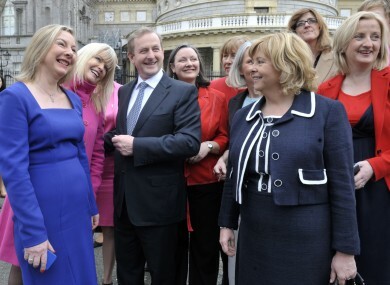 Email “Here's how the junior minister reshuffle showed up Enda Kenny's women problem”. Feedback on “Here's how the junior minister reshuffle showed up Enda Kenny's women problem”.